Synthetic peptide corresponding to Rat 5HT1A Receptor aa 100-200 conjugated to keyhole limpet haemocyanin. This antibody gave a positive signal in both Mouse and Rat hippocampus tissue lysate as well as the following whole cell lysates: Caco2; HepG2; Jurkat. This antibody gave a positive result in IHC in the following FFPE tissue: Human normal liver. Our Abpromise guarantee covers the use of ab85615 in the following tested applications. WB Use a concentration of 1 µg/ml. Detects a band of approximately 62 kDa (predicted molecular weight: 46 kDa). This is one of the several different receptors for 5-hydroxytryptamine (serotonin), a biogenic hormone that functions as a neurotransmitter, a hormone, and a mitogen. The activity of this receptor is mediated by G proteins that inhibit adenylate cyclase activity. Belongs to the G-protein coupled receptor 1 family. 5-hydroxytryptamine receptor subfamily. HTR1A sub-subfamily. IHC image of 5HT1A Receptor staining in Human normal liver formalin fixed paraffin embedded tissue section, performed on a Leica BondTM system using the standard protocol F. The section was pre-treated using heat mediated antigen retrieval with sodium citrate buffer (pH6, epitope retrieval solution 1) for 20 mins. The section was then incubated with ab85615, 5µg/ml, for 15 mins at room temperature and detected using an HRP conjugated compact polymer system. DAB was used as the chromogen. The section was then counterstained with haematoxylin and mounted with DPX. ICC/IF image of ab85615 stained HepG2 cells. The cells were 100% methanol fixed (5 min) and then incubated in 1%BSA / 10% normal goat serum / 0.3M glycine in 0.1% PBS-Tween for 1h to permeabilise the cells and block non-specific protein-protein interactions. 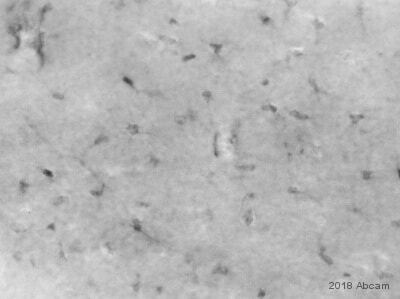 The cells were then incubated with the antibody (ab85615, 5µg/ml) overnight at +4°C. The secondary antibody (green) was Alexa Fluor® 488 goat anti-rabbit IgG (H+L) used at a 1/1000 dilution for 1h. Alexa Fluor® 594 WGA was used to label plasma membranes (red) at a 1/200 dilution for 1h. DAPI was used to stain the cell nuclei (blue) at a concentration of 1.43µM. Immunohistochemistry (PFA perfusion fixed frozen sections) - Anti-5HT1A Receptor antibody (ab85615)Image from Zheng, Yaxin et al. PLoS ONE 10.6 (2015): e0130055. doi: 10.1371/journal.pone.0130055. Fig 5C. Immunohistochemistry (PFA perfusion fixed frozen sections) analysis of rat hippocampus labelling 5HT1A with ab85615 (red). For immunofluorescence analysis, the rats were anaesthetized using chloral hydrate and then were perfused with 150 mL of saline solution and 150–200 mL of 4% paraformaldehyde in 0.1 M phosphate buffer (PB). Then, the brains of the rats were isolated and fixed in 4% paraformaldehyde for 2–3 h. The rat brain sections were cut on a freezing microtome at a thickness of 16 μm and were washed with phosphate-buffered saline (PBS) and pre-incubated in 5% horse serum. Subsequently, the sections were incubated with Anti-5HT1A Receptor antibody (ab85615) for 24 h at 4°C, washed with PBS and incubated with the secondary antibody and neuro tracer for 2 h at room temperature while protected from light. The sections were examined on a Nikon C2 plus confocal laser-scanning microscope. Additional bands at: 37 kDa, 48 kDa. We are unsure as to the identity of these extra bands. The expression profile observed is consistent with what has been described in the literature (PMID: 16772521). Publishing research using ab85615? Please let us know so that we can cite the reference in this datasheet.